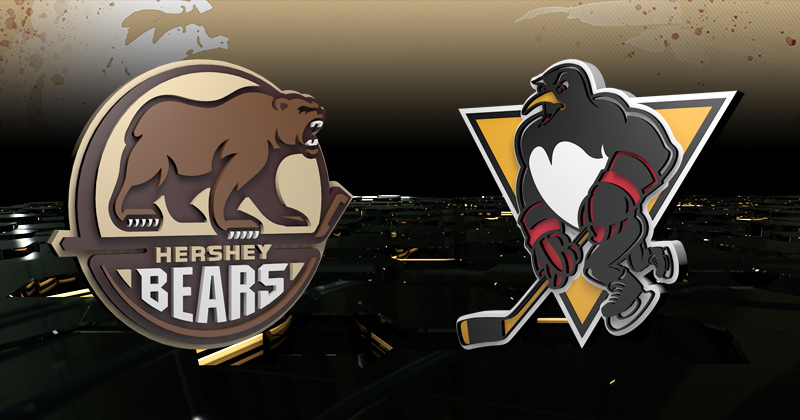 Game Preview: Bears at Penguins, 3:05 p.m.
01/19/2019 - Tonight, the Hershey Bears battle the Wilkes-Barre/Scranton Penguins in the second of three games this week for the Chocolate and White. Puck drop has been moved to 3:05 p.m. from its original start time of 7:05 p.m. due to pending winter weather conditions. The Hershey Bears tied a season-high, three-game winning streak with a 1-0 overtime win over the Binghamton Devils on Wednesday night. Ryan Sproul scored the overtime winner after slipping behind the defense at the 3:20 mark. Ilya Samsonov recorded the 16-save shutout in the win. The Wilkes-Barre/Scranton Penguins were in action last night and dropped a 5-4 decision to the Rochester Americans. Anthony Angello (2), Jimmy Hayes and Adam Johnson scored for the Pens. The Bears have won five of the previous eight meetings against the Penguins in the season series with a 5-2-0-1 record. Hershey is 3-1-0-0 this season at Mohegan Sun Arena, most recently winning 5-1 on Dec. 28, 2018. In the season series, Mike Sgarbossa has tallied seven points (four goals, three assists), as well as Aaron Ness (seven assists). Jayson Megna has also posted four goals in eight games against his former club this season. For the Pens, Teddy Blueger has averaged a point per game against the Bears with four goals and four assists. Within Hershey's current three-game winning streak, Ilya Samsonov has recorded back-to-back shutouts. The rookie goaltender earned his first AHL shutout on Dec. 12 at Lehigh Valley after stopping 18 shots in a 3-0 win. Samsonov followed up the performance with a 16-save shutout in a 1-0 overtime win on Wednesday in Binghamton. The back-to-back shutouts are the first by a Bears goaltender since Pheonix Copley on Oct. 19 and 24, 2014. Ironically, Copley's first of the back-to-back shutouts also occurred in a 1-0 overtime win for the Chocolate and White on Oct. 19. Samsonov's current shutout streak stands at 127:07. Ryan Sproul enters tonight's game on a four-game point streak and has additionally recorded two game-winning goals in Hershey's previous three games. In Hershey's 3-0 shutout win over Lehigh Valley on Dec. 12, Sproul scored the eventual game-winner on Alex Lyon at 2:58 of the 2nd period. Wednesday night, Sproul scored the Bears first and only goal in overtime to beat the Devils. Since joining the Bears in early December, Sproul has appeared in 17 games and posted four goals, five assists. Since the calendar has turned over to 2019, the Mississauga, Ontario native has recorded points in five of six games. Teddy Blueger is in his third season with the Wilkes-Barre/Scranton Penguins and has performed well against the Bears. Entering tonight, Blueger has tallied 22 points (nine goals, 13 assists) in 27 games against the Chocolate and White. Last Saturday, Blueger saw a five-game point streak snapped in a 5-3 loss against the Charlotte Checkers. The Riga, Lativa native enters tonight with 10 points (seven goals, three assists) in his past nine games.